All ceramic crowns were used to restore the implant and old crowns. Crowns are used to reconstruct a single tooth broken down by dental decay. Crowns are made of ceramic, resin, porcelain, porcelain plus metal, or resin plus metal materials. They are bonded or cemented onto the prepared tooth and cannot easily be removed from the tooth once placed. If the tooth was in good alignment before the crown was prepared, the crown will be in good alignment. 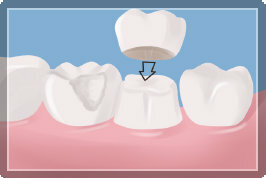 If the tooth was misaligned before the crown, sometimes the crown may be made to obtain a more ideal shape and position. It is cleaned and flossed just like a natural tooth and is most like real teeth. At the Vo Dentistry, we strive to make all treatment solutions uniquely your own - involving our patients in every step of the process. Our goal is to give you the smile you’ve always dreamed of! Shown below are patients who have crowns done by Dr Lia Vo.